Review: "Riverside: Rapid Eye Movement" - Sea of Tranquility - The Web Destination for Progressive Music! Riverside have completed their amazing trilogy with Rapid Eye Movement, an album that lends itself to the melodious side of the debut and the heavier aspect of the band's second album. It achieves a wonderful balance between its two predecessors, emphasizing atmospheric dynamics more effectively and also showing signs of growth and compositional improvement. Like the first two albums, Rapid Eye Movement also contains nine tracks and encapsulates everything what the Polish band stands for: moody soundscapes, emotive vocals, dense keyboard structures, and a solid rhythm background. Though there will always be fans who'll consider Out of Myself Riverside's high point, it is a given that vocalist Mariusz Duda's vocals have improved significantly since the debut came out. Now, Duda incorporates all kinds of styles into his vocalizations with great results. His unique chants that open up "Beyond the Eyelids" function as a foreshadowing to the album's emotionally dark aura throughout its course. His voice is always strengthened by mood-intensive synth work and textural guitar voicings, which eventually transform into jam-like sessions with a strong rhythm presence. The instrumentation on the track is underpinned by keyboardist Michal Lapaj's electronic sequencing, which works brilliantly underneath Duda's doubled vocal harmony that occasionally borders on aggressive outbursts. The band must have been heavily inspired by Porcupine Tree while composing "Rainbow Box", right down to the vocals. Built around an instantly memorable main riff, this is one of the shorter pieces that lends itself to crunchy rhythm variations, around which Piotr Grudzinski's textural guitar lines are woven. The single-note keyboard in the background is stretched into eternity to provide an extra layer of atmosphere; and segues into "02 Panic Room", a track with a heavily synthesized bass line and a cool guitar theme. This theme is subtly developed whilst fizzling synth sounds pan on the right and left speakers (listen to it with headphones) and Duda's schizophrenic whispers are filtered through a thick soundscape. The last section of the song, while giving the impression that it may have been added as an afterthought upon first list, is comprised of cold acoustic guitars and funereal atmosphere, mostly because of Duda's low monotone singing. The way the guitar sound becomes less and less audible while Duda's voice is set against a mournful piano figure are testimony to Riverside's aesthetic ability, not only songwriting-wise but also from a production standpoint. From here on, the album sinks into the depths of despair. "Schizophrenic Prayer" boasts Middle Eastern acoustic guitars and a mournful vocal delivery which eventually culminates in a terrific melody. Duda's wordless humming and tragic croon precede a drawn-out instrumental middle part, formed by a steady, unbreakable rhythm. The song is finished off with some of the most schizophrenic whispers and repeated guitar themes you'll hear on any progressive rock release. Much like "Schizophrenic Prayer", "Through the Other Side" and "Embryonic" are also compositions proceeding in a glacial pace. They are both characterized by a largely acoustic framework; the contrast between Duda's ultimately soothing and reassuring voice and the terribly disturbing subject matter on "Embryonic" is impossible to ignore. 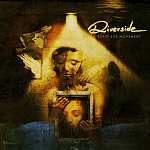 Riverside brings together opposite poles of songwriting elements here, and concludes the track with a phenomenal guitar solo which recalls Jim Matheos' restrained playing on A Pleasant Shade of Gray, due to its context. It's got the same vibe of building the whole album up and then climaxing with a killer solo that is emotionally draining. The most progressive cut on the album is "Parasomnia", one of the longer pieces. Not only does it marry the hallmarks of the Riverside sound their fans have come to love over the years, it is a track with a powerful bass centre and wonderful harmonies. The a capella intro alone is worth checking this album out, Duda has rarely before captured so much intensity within only a couple of seconds. As the song proceeds, amidst rampaging bass and Tool-like tribal drumming, Piotr Grudzinski intensifies its degree of heaviness with added guitar voicings and shifts of tempo. The song retreats into a dreamy section, filled with Porcupine Tree-like acoustic guitars and floating synth lines, not to mention the Floydian guitar solo. Just as its intro, the overly repeated whispering atop sparse synth notes at the very end is simply sick -- and his chants are to die for. Duda is among the most expressive singers in this genre no matter what anyone says. There is another epic-length song on the album to finalise the three-part concept story. After a long jammy intro, "Ultimate Trip" merges both vintage and modern synth sounds, developing a unique Riverside aesthetic, and contains extensive lead work by both Grudzinski and Lapaj. The tense silence in the middle is only a chance for the listener to take a breath as the piece is concluded with smashing rhythm battery and impressive guitar work. The debut album was perhaps the band's most melodically engaging work while Second Life Syndrome saw the band expanding into heavier territory accentuated by intense guitar work. As for Rapid Eye Movement, this is their most atmospheric statement, created to underline the psychological turmoil of the protoganist. This is not to say any of their albums lack melody or atmospheric depth; it's just each album has its own priority and the level of cohesion achieved between each release is remarkable. The production is amazing, perhaps their best. Upon the first couple of listens, I had to think of the production of Katatonia's The Great Cold Distance, though this has somewhat waned now. Still, I can't help but listen to these albums back to back -- they do have something in common, at least spiritually. Now that they've released their albums and solidified their sound, it will be interesting to observe what kind of path Riverside will forge on their future albums. Riverside is one of those bands that you can honestly say you can really count on each and every time they come out with a new album and expect something extraordinary. Granted, Rapid Eye Movement is only the third in their trilogy of full-length releases, but with a pedigree as good as Out of Myself and Second Life Syndrome, Rapid Eye Movement had a lot to live up to. And guess what, it most certainly does! This time around the influences of Porcupine Tree and Dream Theater have been fully realized, and although Riverside doesn't sound exactly like either band, there's enough references in their music to say "hey, that reminds me of so and so", but ultimately they have developed a sound and style all their own. The CD is divided into two parts, the first being Part One-Fearless, which is comprised of five tracks. "Beyond the Eyelids" kicks things off with plenty of bombast & prog metal riffs, with Mariusz Duda leading the charge with his powerful & emotional vocals, which are quickly become some of the best in the genre. "Rainbow Box" and "02 Panic Room" are spacey prog pieces, with a hint of Porcupine Tree and Pink Floyd, featuring lots of bubbling synths, groove laden bass, orchestrations, tight guitar riffs, and Duda's soaring vocals. The melodies here are just gorgeous and instantly memorable. After the lulling "Schizophrenic Prayer", an atmospheric, Middle Eastern tinged dreamer, the band cranks out the symphonic prog metal on "Parasomnia", a real burner featuring pounding riffs and layers of keys. This one's got plenty of drama, and if you like dark, heavy prog, you've come to the right place. Part Two-Fearland plays more on the dark, atmospheric side of things, and requires more attention than the first part. "Through the Other Side" is a dreamy, spacey Floydian number, with droning synths floating through deep dark space and supported only by gentle percussion and acoustic guitar. "Embryonic" follows a similar pattern, but brightens things up just a tad thanks to Duda's charming vocals and a lyrical guitar solo. The heavy guitar riffs return on "Cybernetic Pillow", as the band draws on their experience on the road with Dream Theater, layering the keyboard & guitar passages for some complex interplay while the rhythms work overtime. This one will have you headbanging in no time, and the raging Hammond attack instantly recalls vintage Deep Purple. The closer "Ultimate Trip" is perhaps the CD's most complex piece, featuring plenty of intricate guitar & synth patterns, and Duda's vocals are spot on, full of power and conviction. It's not everyday that you come across an album in this genre that's just so damn melodic as this one is. Despite the fact that Rapid Eye Movement will require repeated listens to fully enjoy it, once you accomplish that you'll notice just how catchy these songs are, yet how deep and progressive the music actually is. What a great year its been already for progressive rock/metal with the likes of fantastic new releases from Dream Theater, sun Caged, Porcupine Tree and others. For me, this Double CD, is right up ther with the the best. This is Riversides most accessible album so far, and I would say their best yet. Mariusz Duda here sings better than ever and has a similar range to Steve Hogarth (Marillion). His bass playing is never less than outstanding, especially on "Rainbow Box" and "Panic Room". In fact all the guys play better than ever. The music is very dynamic and emotionally stirring at times. Check out the stunning acoustic tracks "Through the other side" and "Embryonic". Anyone who enjoys Dream Theater to Marillion should buy this, you wont be disappointed. Deepest respect, once again to Inside Out, who have pushed the boat out and produced another well packaged digipak CD. So much better than the disappointing and easily breakable jewelcases. These guys must really be fans of Progressive music!.